The nation's retailers are expected to speed up efforts to reduce plastic waste in 2019 as environmental pollution caused by indiscreet use of these products has come to the fore, since the Chinese government declared a ban on imports of plastic waste in January 2018. After experiencing the so-called "waste crisis," the Ministry of Environment even began implementing a regulation in August to prohibit coffee shops from giving disposable cups to customers who drink beverages inside the stores. Against this backdrop, a growing number of businesses in Korea have decided to use eco-friendly material and reduce waste in the New Year. It is hoped the attempt will help minimize microplastic pollution which is regarded as the main destroyer of the marine ecosystem. Starbucks Coffee Korea is one of companies that has taken the lead in such efforts. The coffeehouse, which began a trial run of paper straws at 100 shops in September, introduced white-colored paper straws to all of its stores nationwide in November. It also came up with a straw-free lid that allows customers to drink iced Americano and iced latte without straws. The company said plastic stirrers were also replaced with wooden ones, and plastic bags which had been used for taking out multiple beverages have been disappearing since mid-December, due to the use of paper bags. According to Starbucks Coffee Korea, it used 180 million plastic straws in 2017, which collectively would weigh 126 tons and measure 37,800 kilometers in length. The use of paper straws will therefore allow the company to reduce a huge amount of plastic waste. "Eco-friendly business management is unavoidable for future generations," Starbucks Coffee Korea CEO Lee Seock-koo said. "The Greener Starbucks Korea campaign shows our strong determination to preserve the environment. It is also a promise to our customers. We will try our best to have a positive influence on the environment." Other coffee shop chains in Korea have made similar efforts. Angel-in-us Coffee introduced a straw-free lid, and A Twosome Place decided to use colorless paper cups for easier recycling. 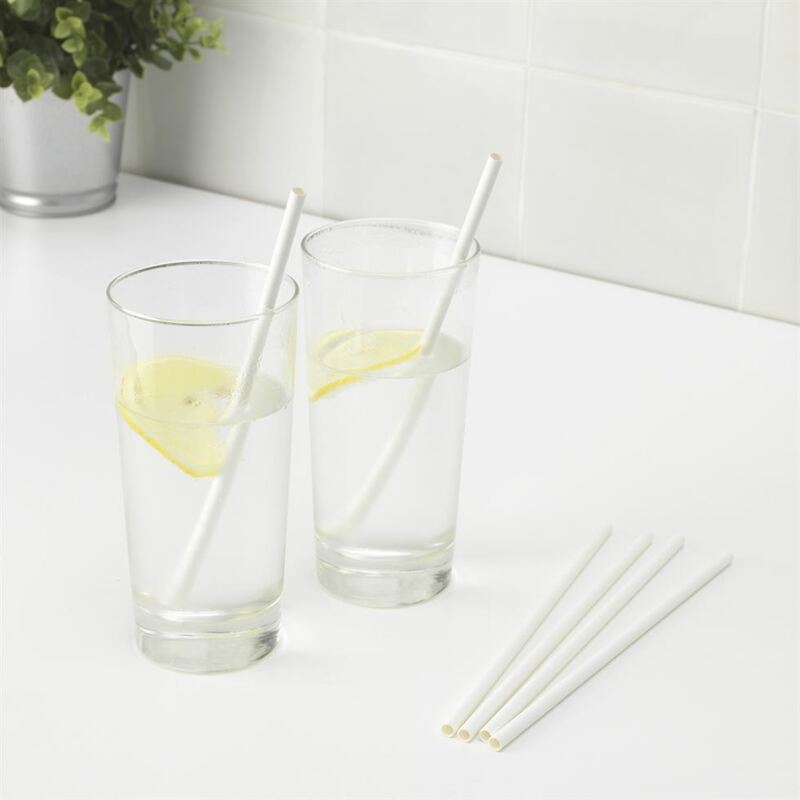 IKEA Korea, a local subsidiary of the Swedish home furnishing retailer, also started phasing out all single-use plastic straws from its restaurants and cafes in its Gwangmyeong and Goyang stores in Gyeonggi Province from Nov. 1. It has replaced them with paper straws, and plans to remove all single-use plastic items from its restaurants, bistros and cafes by the end of August 2019. "Single-use plastic can greatly damage ecosystems when it is not disposed of responsibly," IKEA Korea country retail manager Andre Schmidtgall said. "We are determined to play our part to reduce the climate impact and contribute to a world without waste. We invite our customers to join us in our meaningful step towards creating a healthy planet." Convenience store chains have developed eco-friendly lunchboxes, in line with the trend of "plastic-free" management. GS25, which released a lunchbox using bio-based polypropylene in August, aims to replace 50 percent of lunchboxes with the eco-friendly material by the end of 2018 and all of them by the end of 2019. CU, another convenience store chain that came up with a lunchbox made with biomass in August, said it will introduce a new type of lunchbox without a plastic lid by the end of the first quarter of 2019. According to BGF Retail, the operator of the convenience store chain, the new packaging will allow the retailer to reduce 30 percent of waste from plastic lids annually. "As there is a saying that we borrow the environment from future generations, all of us should preserve the environment," a BGF Retail official said. "We will continue eco-friendly management." Beverage makers signed a memorandum of understanding with the environment ministry in April to agree to the production of colorless plastic bottles in 2019. The ministry expects the production of colorless plastic bottles by 19 beverage makers here will increase the proportion of such bottles to 85.1 percent in 2019 from 63.5 percent in 2016. "Considering the Japanese government's ban on colored plastic bottles which are hard to recycle, the agreement will greatly contribute to easier recycling," an environment ministry official said. E-mart also said in October it will use colorless plastic bottles and lids for 100 types of private labeled mineral water and beverages. The discount chain will use easy-to-detach labels as well. "Through exemplary green management, we have fulfilled our corporate responsibility of arousing sympathy with eco-friendlier consumption," an E-mart executive said. "We will raise awareness about the importance of recycling by coming up with products for easier recycling." Industry experts heralded a new era where people "must" consider the environment, unlike the past when people could think about the environment only if they need to. "Consumers demand stricter standards for their safety," said Kim Ran-do, professor of consumer science and trends at Seoul National University. "More consumers have been concerned about the environment, due to unusual weather conditions, such as fine dust and scorching heat." The Seoul International Cafe Show Secretariat also mentioned "eco-essential" as one of four keywords for the nation's coffee industry in 2019. According to the experts, however, Korea is not the only country that has begun paying bigger attention to plastic waste and eco-friendly consumption. The theme of World Environment Day 2018 was "beat plastic pollution," and the United Nations recommended its members impose taxes on the use of plastic bags and containers. The European Union also announced it would ban companies from manufacturing plastic straws and cotton swabs to reduce marine pollution. In addition, British Prime Minister Theresa May enforced a sales ban on cosmetics products using microbeads in line with her plan to reduce unnecessary plastic waste by the end of 2042. During the Segyero Forum held in Dec. 13 by the Korea Trade-Investment Promotion Agency (KOTRA), KOTRA's trade information team leader Jun Woo-hyung mentioned sustainable development represented by swimsuits made with waste plastic and edible straws as one of five leading trends for the global business model in 2019.